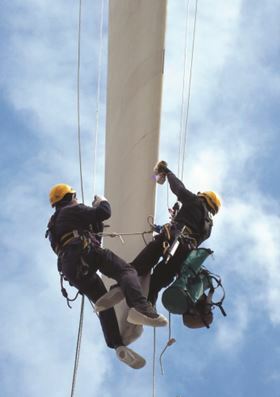 Technicians repairing a wind turbine blade using a handheld UV lamp. Comparison of the time taken for a RENUVO repair versus a wet system repair. 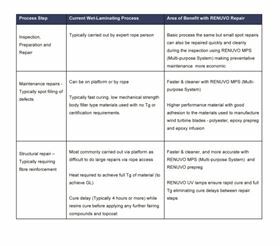 Benefits of RENUVO repair versus current wet laminating systems for different types of repair. Gurit has developed a high intensity LED UV lamp to offer an IP54 rated repair system suitable for use in the field. The adoption of wind energy has been the backbone of the green revolution for renewable energy. Once installed the wind turbines are estimated to have a life expectancy of 20+ years. Although maintenance requirements are low, the turbine blades do not receive the attention and frequent review that other turbine components do. Operations and maintenance are critical elements in a wind turbine’s lifecycle costs and ensuring maximum availability throughout the year is key to success. By reviewing the lifecycle of a turbine blade it is easy to see where damage occurs. After leaving the factory this large composite structure needs to travel, often long distances, to its end destination. With changes in modes of transport and the need to negotiate ports, roads and sometimes towns, the opportunity for impact damage is great. Once onsite, the assembly process and hoisting of the completed nacelle up onto the tower is another opportunity for damage. In operation a variety of environmental events like lightning strikes, rain and wind erosion are all possible causes of damage. Although these causes of environmental damage are not accounted for in the planning process, there are additional factors such as wind turbulence and wind direction changes that are. These conditions can have a severe impact on the fatigue experienced by the turbine blades and can lead to early ‘wear and tear’ damage. Before looking at the repair process and the materials used, it is important to appreciate the impact of poor maintenance. With minimal leading edge erosion having a performance impact of 3-4% on the blade’s efficiency, the loss in revenue is clear. The next level of damage could be egress of moisture through the laminate skin structure, as a result of the erosion or possible lightning strike damage. It is not difficult to visualise the effect of this damage when you think about ice cubes in the fridge. When the temperature drops, the volume of frozen water, being greater than the liquid form, causes a tremendous stress on the surrounding substrate. This can in some instances split the blade edge or de-bond a section of a load bearing beam. Where these faults are not repaired there arises the potential for imbalance in the rotor blade set, strain on the nacelle and additional wear being exerted on the bearing. There is also the additional potential for loss in blade stiffness and the risk of a catastrophic failure caused by an impact with the tower. Looking at the incumbent repair materials approved for turbine repair, it can be seen that the systems are time consuming, specific to the original blade substrate construction (polyester should only ever be used in the repair of polyester blades) and currently limited to use in a narrow temperature window (above 15°C). Typically the styrene within polyester and vinyl ester wet-laminating resins cured below 15°C has a tendency to homo-polymerise rather than co-polymerise with the vinyl ester or polyester resin. This can lead to a resin with permanent under cure even when subsequently heated. Epoxy resins can be prone to ‘bi-product’ at low ambient temperatures and at high ambient humidity. Again this can lead to the resin exhibiting permanent under cure and inter-laminar adhesion problems. These resins are difficult and messy to apply when using rope or platform access to repair wind turbine blades, especially when you add high wind and cold temperatures into the equation. As a result, wind turbine blades often do not receive the regular maintenance required to keep them operating at maximum efficiency, or are left waiting for repair, reducing the energy that can be harnessed by the wind farm operator. Another problem is that wet resins do not reach their ultimate datasheet mechanical and thermal resistance properties unless given the correct heated post cure. This can be overlooked given the difficulty of getting heat reliably into the laminate or in the haste to get the turbine operational. It is this crucial step that is required to satisfy Germanischer Lloyd (GL) requirements for material performance in a wet laminating repair. This standard is a necessity for many turbine manufacturers and increasing called for by infield companies supporting the post warranty market. With these issues in mind Gurit has developed and launched the RENUVO™ blade repair system. Depending on the thickness of the composite laminate a high intensity ultraviolet (UV) cure of 60-180 seconds will cure the material to its full datasheet value. The RENUVO materials are specially formulated and exhibit excellent handling, adhesion and cured properties at temperatures as low as +5°C and at high humidity levels, extending the current repair window. It has been the combination of the low temperature operating window and fast UV cure system that have been groundbreaking factor in the GL certification of RENUVO. In addition to tolerance to high and low temperature and humidity levels RENUVO products offer a number of benefits in the repair schedule. Due to the nature of the UV curing system, a full and rapid cure is achievable without the need for the application of heat or a lengthy wait. This rapid cure time allows for wind turbines to return to service considerably sooner following a repair than conventional ‘wet repairs’ and operators are safe in the knowledge that the full properties of the laminate have been achieved. The RENUVO system consists of two materials and a UV lamp system, backed up by the process know-how and support of Gurit’s composite processing technical team. The first material is the RENUVO Multi-Purpose System (MPS). This is a mono-component rapid UV curing resin, which comes in Summer and Winter grades to provide consistent product viscosity across the full temperature range. It is supplied in ‘ready to use’ 310 ml cartridges that fit a standard mastic gun. The Summer grade has a handling temperature of 15-30°C. The Winter grade has a handling temperature of 5-18°C. The relatively consistent viscosity of the RENUVO MPS resin throughout the suggested working temperature range was another measure taken by Gurit to build extra confidence in the application procedure. The operator is able to gauge the workability of the repair work to ensure good quality. a sacrificial finishing layer to abrade before applying a top-coat. With the high power RENUVO lamp cures up to 10 mm thick are possible within 180 seconds. Thinner sections (typically 3 mm) can be cured in 60-90 seconds. The second RENUVO product is a fibre reinforced prepreg (RENUVO PP) with a high performance matrix resin for outstanding laminate properties. One option for structural repair is to cut the plies of prepreg into the correct profiles, which are then pre-consolidated to give a repair patch consisting of the desired fibre weight, orientation and geometry. A thin layer of MPS is applied to the prepreg to ensure adequate wetting and adhesion to the substrate. Alternatively RENUVO PP can be applied in single plies to the repair with a thin layer of RENUVO MPS applied between the prepreg layers. Unlike a wet system the prepreg patch is easy to position on the repair and it is easy to get the patch to match up to the repair area without distorting the fibre alignment. Each patch is then cured using a high intensity UV source for rapid cure and consistent properties which are higher than those obtainable with wet laminating. During the development of the RENUVO system, Gurit studied the mechanical properties and thermal property development produced by a wide variety of UV sources using dynamic mechanical analysis (DMA) analytical equipment. To make the repair system suitable for the mercury vapour or metal halide lamps typically used for UV curable inks and coatings was found to be very problematic. Gurit then considered the latest LED curing technology. Since a suitable system was not available, Gurit worked with lamp manufacturers to develop a high intensity RENUVO LED UV lamp to offer an IP54 rated repair system suitable for use in the field. The advantage of the LED system is that unlike traditional mercury vapour lamp technology, it can be switched on and off without damage or drop in light intensity. The industrial nature of blade repair also played a significant role in the selection of the curing technology. With poor environment conditions and rugged transportation requirements, a mercury vapour system would be too fragile and the risk of failure in service too great. Using the LED system a 250 mm x 50 mm area can be cured in 180 seconds. The unit is programmed via a USB interface to prevent errors in the cure cycle, enabling a single button operation for in-field use. This also allows for special instances when the unit can be re-programmed for a faster cure if a thinner laminate stack is to be repaired. The high intensity UV lamp system is needed for structural prepreg repairs whereas a lower power spot lamp can be used for small spot repairs of the MPS paste. For reliability the adhesion of the repairs to the three main types of resin systems used to manufacture blades was tested using double lap shear and fracture toughness test methods, at different temperatures and humidity. Samples were also immersed in water to see if water would ingress and attack the bond to assess the durability of the repair. Market acceptance of this fact is an important step in the adoption of RENUVO. The ability to stock one material solution for all blade constructions is a significant benefit to infield repair companies having to carry multiple hazardous raw materials. With process trials and refinement at Gurit’s prototyping centre, Gurit identified the need to assist operators in the field indexing the lamp head to cure larger repair areas without leaving an under-exposed section. 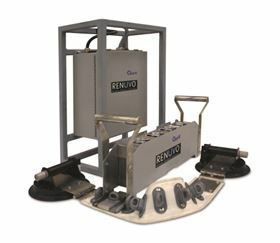 The RENUVO lamp system now comes with an indexing device that consists of a set of straps with locators which are first attached to the blade and are designed to match the lamp handle system, allowing the lamp to be reliably indexed over a wider repair. The pitch of the device was first tested by sectioning panels cured in the lab to find a pitch that allowed for positioning tolerance and consistent properties across a panel too large to be cured in a single operation. With a number of process iterations and product improvements completed within the lab and prototype centre Gurit moved to test in the field. The product has been well received by those who have tested it, with end users benefiting from the speed and reliability of use. Rope teams have been particularly impressed with how clean the system is to use and with the ability to take RENUVO with them on inspections to repair minor defects. Gurit has also taken the additional step of offering one-day workshops to the Operations and Maintenance market. These open events provided the RENUVO MPS and RENUVO PP materials and the RENUVO Lamp Technology for operators to carry out repairs in a controlled and supervised environment to build confidence in the products. This was also an education for Gurit, which could see the varied repair formats and techniques used in the industry, providing essential feedback for future work. With the cooler winter months upon us the RENUVO blade repair system enables the industry to continue to schedule repair programmes and be able to react quickly to unplanned incidents that may have previously resulted in turbines having to remain offline for the remainder of the winter to wait for repair. ? This feature was published in the January/February 2011 issue of Reinforced Plastics magazine. © 2011 Elsevier Ltd. All rights reserved.